I absolutely hate ‘family sagas’, so while I have heard this novel so described, I have to say that I never even thought of it in those terms. Yes, it’s about a family, but it isn’t a saga, it’s an intricate, insightful story. Indeed ‘Instructions for a Heatwave’ epitomises my feelings about character. No matter what other flaws a book may have, if the characters come alive on the page, if you care what happens to them, for good or evil, you’re more than half way there. Not that I can find many flaws in this book. It’s well constructed and beautifully written and there’s enough tension to keep you turning the pages. I couldn’t put it down. True, the tensions and incidents are small or fairly common ones – involving siblings, cats, babies, emotions, second marriages and more. That said there is also the unexpected –- such as Aoife’s illiteracy. Treated here with sensitivity and woven skilfully into her personal story. Indeed for me the joy of this book was the Riordan family. Lovable, exasperating, irritating, dysfunctional – all of this and more. Perhaps it’s because I was brought up by Irish parents in an Irish community that I can relate so well. This is not to take anything from the superb writing – the individual family members leap off the page – but for me they are also familiar. Though thank God my mother was a million miles away from being a Gretta. Nevertheless, I have come across many Grettas in my time. And always wanted to smack them. If Gretta stands out as being the most annoying, the siblings are endearing, warts and all. You feel for each of them, their dilemmas, their baggage. Such is Maggie O’Farrell’s skill that you ‘get’ Gretta from the very first page when she wakes before dawn and comes downstairs in the suffocating heat of that exceptional summer. She makes straight for the kitchen because – ‘Only she would choose to bake bread in such weather.’ Why in God’s name is this woman baking bread in a heatwave? The answer is as complicated as she is – a mixture of tradition, stubbornness, self-righteousness, hypocrisy, martyrdom and self-deception. If Gretta stands out as being the most annoying, the siblings are endearing, warts and all. You feel for each of them, their dilemmas, their baggage – the result of having been brought up in a family where much remains hidden and unspoken. Where misunderstandings are rife and alliances are formed, giving rise to still more misunderstandings. I haven’t mentioned the father, Robert, who appears only briefly though he is present throughout. He too is the victim of his own culture and the era he was born in. His relationship to Gretta is complex and repressed, explained with a light touch and often obliquely, through the eyes of others. The events in this book are not extraordinary but they are, undeniably, of fundamental importance to the lives of the characters. So I did care, I did hold my breath. I did want to shake some of them and hug others. I absolutely loved Aiofe and had enormous sympathy for the fragile Monica, the ‘good girl’, carrying the burden of being Gretta’s favourite. I thoroughly enjoyed this book – the story, the wonderful writing, the light touch, the depth. 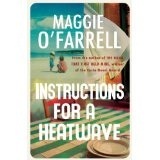 I read Maggie O’Farrell’s debut novel a while ago. I’m now eager to read the others.